158 pages | 5 B/W Illus. Marriage is central to Indonesia’s social fabric and critical in defining socially legitimate relationships. This book offers a rich anthropological account of Muslim Indonesian women’s experiences of courtship, love, marital discord and separation, polygamy, divorce and remarriage. By applying a new approach to theorising marital experiences as playing out across a dynamic marital continuum, it expands static and dichotomous understandings of marriage and divorce. It offers new insights on how local modalities of Islam shape gender relations and are actively negotiated by women in pursing their marital desires. The book draws upon ethnographic case studies from the eastern Indonesian island of Lombok where early marriage, divorce and remarriage, are common place for Muslim women. In this context up to 70 per cent of marriages are legitimated through Islamic ceremonies and remain unregistered with the state. While these unregistered marriages are legally valid within the communities in which they occur, such unions exclude women from accessing the marital rights theoretically enshrined in Indonesian marriage law. 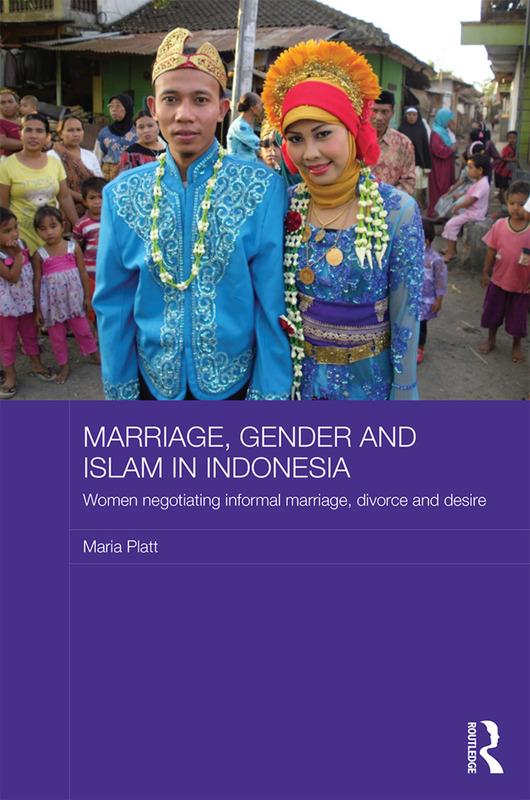 A key contribution of this book lies in its exploration of legal plurality in relation to Indonesian marriage, which involves investigating the salience of Islamic law, local customary law and state law, for women’s varied marital trajectories. Maria Platt is a Research Affiliate in the Asia Research Institute, National University of Singapore.